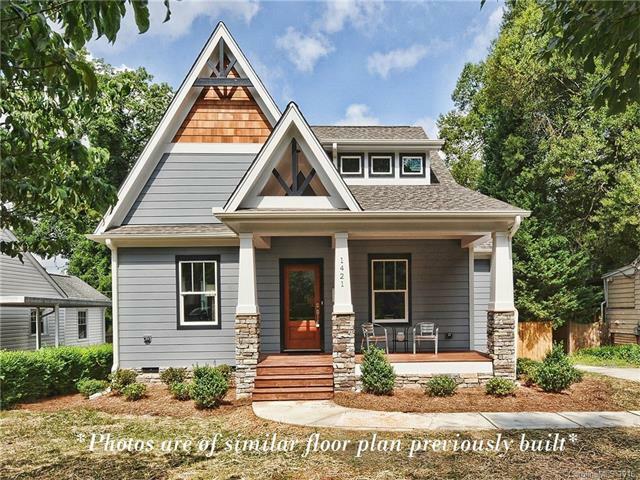 Midwood bungalow in enclave of craftsman homes near NoDa & light rail. Striking 2-story great room & fireplace, open to chef’s kitchen with quartz embedded granite countertops & breakfast bar seating. White subway tile backsplash, shaker cabinets, stainless appliances, gas range & chrome hardware. Spacious 1st floor owners suite with coffered ceiling detail, WIC, Carrara marble dual vanity, freestanding tub & tile shower. 3 Beds upstairs with en suite baths & WICs, plus lofted niche. The data relating to real estate on this website derive in part from the Internet Data Exchange program. Brokers make an effort to deliver accurate information, but buyers should independently verify any information on which they will rely in a transaction. All properties are subject to prior sale, change or withdrawal. Neither Tierra Bella Realty nor any listing broker shall be responsible for any typographical errors, misinformation, or misprints, and they shall be held totally harmless from any damages arising from reliance upon this data. This data is provided exclusively for consumers’ personal, non-commercial use and may not be used for any purpose other than to identify prospective properties they may be interested in purchasing. © 2016 Carolina Multiple Listing Services, Inc.